One of the lowest mass black holes ever observed in the middle of a galaxy has been identified. The black hole is located in the middle of the spiral galaxy NGC 4178, shown in this Sloan Digital Sky Survey image. The inset is a Chandra image showing an X-ray source at the position of the black hole. Data from Chandra, the Spitzer Space Telescope and the Very Large Array suggest that the black hole has a mass less than about 200,000 times that of the sun. One of the lowest mass supermassive black holes ever observed in the middle of a galaxy has been identified, thanks to NASA's Chandra X-ray Observatory and several other observatories. The host galaxy is of a type not expected to harbor supermassive black holes, suggesting that this black hole, while related to its supermassive cousins, may have a different origin. The black hole is located in the middle of the spiral galaxy NGC 4178, shown in this image from the Sloan Digital Sky Survey. The inset shows an X-ray source at the position of the black hole, in the center of a Chandra image (roll your mouse over the image above). An analysis of the Chandra data, along with infrared data from NASA's Spitzer Space Telescope and radio data from the NSF's Very Large Array suggests that the black hole is near the extreme low-mass end of the supermassive black hole range. These results were published in the July 1, 2012 issue of The Astrophysical Journal by Nathan Secrest, from George Mason University in Fairfax, Virginia, and collaborators. 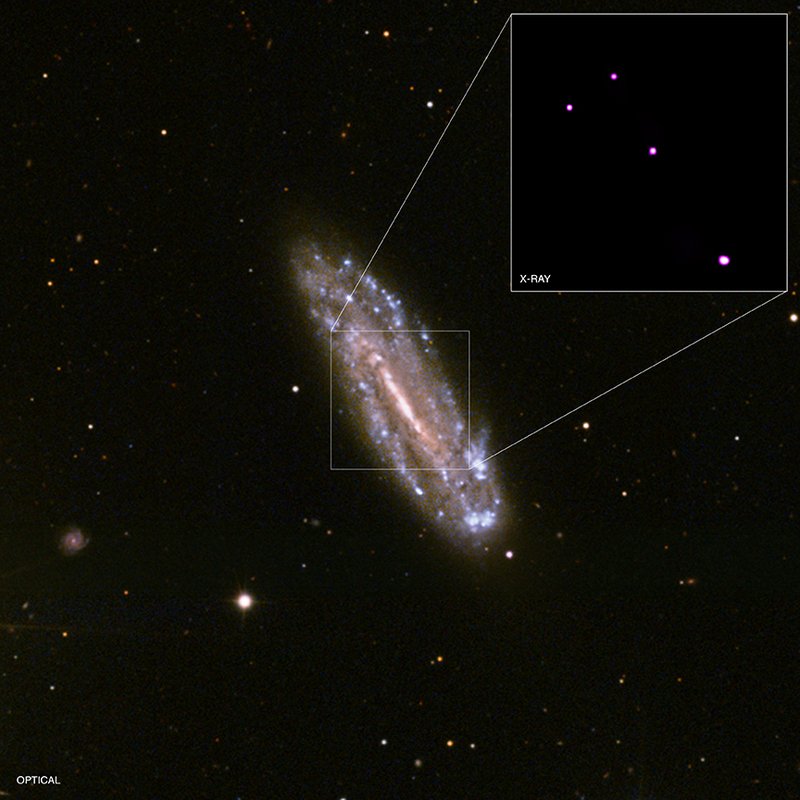 The properties of the X-ray source, including its brightness and spectrum - the amount of X-rays at different wavelengths - and its brightness at infrared wavelengths, suggest that a black hole in the center of NGC 4178 is rapidly pulling in material from its surroundings. The same data also suggest that light generated by this infalling material is heavily absorbed by gas and dust surrounding the black hole. A known relationship between the mass of a black hole and the amount of X-rays and radio waves it generates was used to estimate the mass of the black hole. This method gives a black hole mass estimate of less than about 200,000 times that of the sun. This agrees with mass estimates from several other methods employed by the authors, and is lower than the typical values for supermassive black holes of millions to billions of times the mass of the sun. NGC 4178 is a spiral galaxy located about 55 million light years from Earth. It does not contain a bright central concentration, or bulge, of stars in its center. Besides NGC 4178, four other galaxies without bulges are currently thought to contain supermassive black holes.  Of these four black holes, two have masses that may be close to that of the black hole in NGC 4178. XMM-Newton observations of an X-ray source discovered by Chandra in the center of the galaxy NGC 4561 indicate that the mass of this black hole is greater than 20,000 times the mass of the sun, but the mass could be substantially higher if the black hole is pulling in material slowly, causing it to generate less X-ray emission. A paper describing these results was published in the October 1st, 2012 issue of The Astrophysical Journal by Araya Salvo and collaborators. The mass of the black hole in the galaxy NGC 4395 is estimated to be about 360,000 times the mass of the sun, as published by Peterson and collaborators in the October 20, 2005 issue of the Astrophysical Journal. Previously, astronomers have found that observations of a large number of galaxies are consistent with a close correlation between the mass of a supermassive black hole and the mass of the bulge of its host galaxy. Theoretical models developed to explain these results invoke mergers of galaxies, and predict that galaxies without bulges are unlikely to host supermassive black holes. The results found for NGC 4178 and the four other galaxies mentioned run counter to these predictions, and may suggest that more than one mechanism is at work in forming supermassive black holes. Three other X-ray sources were found in the Chandra image. If they are located in NGC 4178 they are likely to be binary systems containing a black hole or neutron star. The brightest of the three sources may be an intermediate-mass black hole with a mass that is about 6,000 times that of the sun. The co-authors of the paper describing these results are Shobita Satyapal, and Mario Gliozzi, from George Mason University; Teddy Cheung, from the National Academy of Science in Washington DC; Anil Seth, from the University of Utah in Salt Lake City, UT, and Torsten Böker from ESA/ESTEC in the Netherlands. Coordinates (J2000) RA 12h 12m 46.40s | Dec +10° 51´ 57.00"
And those other three super masses. Calls into question the claim that the nucleus of a galaxy cannot loose mass. I love reading about space. It's so cool. I wish i could work for NASA. Looking at the center of all galaxies there seems to always exist a "black hole". At looking at hurricanes with its massive storm winds rotating around a central eye, along with its eye wall; are there similarities between hurricanes and galaxies? Both a hurricane and galaxies have similar properties; a center point which is smaller in mass than what rotates around it. On the outer rim of the eye of the storm exist an eye wall, on the outer rim of the black hole exist the accretion disk. I am very glad to be on the Chandra X-Ray Observatory website, and having the chance(s) to see the observatories results. Black holes have become the thing many astronomers, including amateurs, want to understand. The best, most impressive images in a long time. Thanks. One of the lowest mass supermassive black holes ever observed in the middle of a galaxy. About 55 million light years from Earth. X-rays from Chandra X-ray Observatory and optical data from the Sloan Digital Sky Survey. .
About 160,000 light years across.